UP Trivia / Bar Bets: Who put Sol in the Solar System? 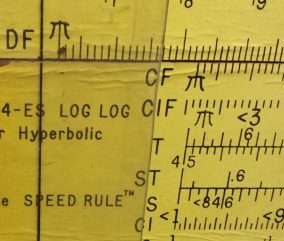 Positioned above the interior doorway of the University Museum is a large-scale yellow Pickett N4-ES Vector Hyperbolic Log Log Dual-Base Slide Rule. With moving parts. Somewhat easier to use than a Rubik’s Cube. The moving parts were the point, allowing classroom demonstrations. Aristarchus of Samos [fl. 250 BCE] according to the report of Archimedes (trans, Thom. 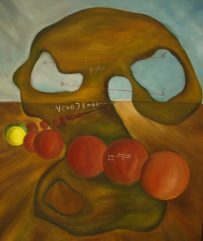 Heath, 1897), considered the distances of the heliocentric system to be too incomprehensible to measure (like the interior angles of a chiliagon or the enumeration of the sand-grains on all the beaches of all the oceans). John Napier in 1614 in Mirifici Logarithmorum Cannois Descriptio found a way to fold complex equations answering the problems of scale and celestial magnitudes. 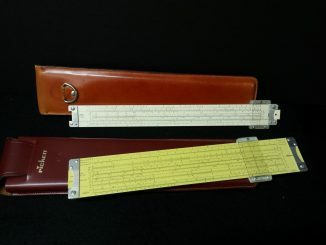 Slide rules were used by Engineering and Physics students at UP through the 70s. The slide rule was a useful tool for solving equations in analytics and trigonometry. Once a required school supply, the microchip revolution doomed this plastic analog technology. The introduction of the (affordable) pocket calculator in the mid to late 1970s eliminated the slide rule from shirt-pockets and belt-holsters, leading to a different aesthetic in geek chic. 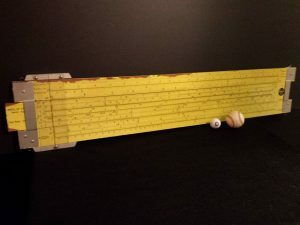 Even so, the slide rule is a tool requiring neither batteries nor electricity for those who appreciate (or enjoy) manual computations in case of power-outages. Still have two – one normal size and one very worn pocket size.